My stone is red for the blood they shed. The medal I bear is my country’s way to show they care. If I could be seen by all mankind maybe peace will come in my lifetime. Erected by Union County Chapter #28 M.O.P.H. Location. 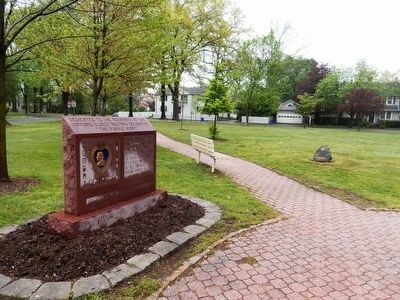 40° 39.67′ N, 74° 18.458′ W. Marker is in Cranford, New Jersey, in Union County. Marker is on Springfield Avenue. Touch for map. This memorial is located in Memorial Park. Marker is at or near this postal address: 350 Springfield Avenue, Cranford NJ 07016, United States of America. Touch for directions. (approx. 0.3 miles away); Crane Farm and Village Home Site (approx. 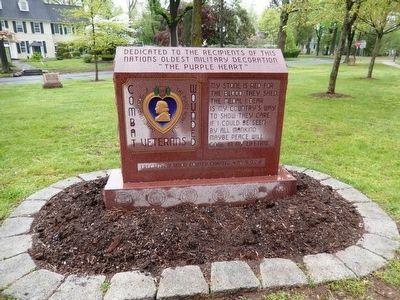 0.3 miles away); Kenilworth Veterans Memorial (approx. 1.4 miles away); Kenilworth 9/11 Memorial (approx. 1.4 miles away). Touch for a list and map of all markers in Cranford. Credits. This page was last revised on June 16, 2016. This page originally submitted on May 7, 2016, by Don Morfe of Baltimore, Maryland. This page has been viewed 177 times since then and 4 times this year. Photos: 1, 2. submitted on May 7, 2016, by Don Morfe of Baltimore, Maryland. • Bill Pfingsten was the editor who published this page.